WASHINGTON (Nov. 02, 2010) -- The Army has a goal of "net-zero" energy consumption by 2030, one of three challenges laid out by the service's assistant secretary for installations, energy and the environment. Net-zero energy means an installation or building produces as much energy as it consumes, resulting in a net usage of zero. 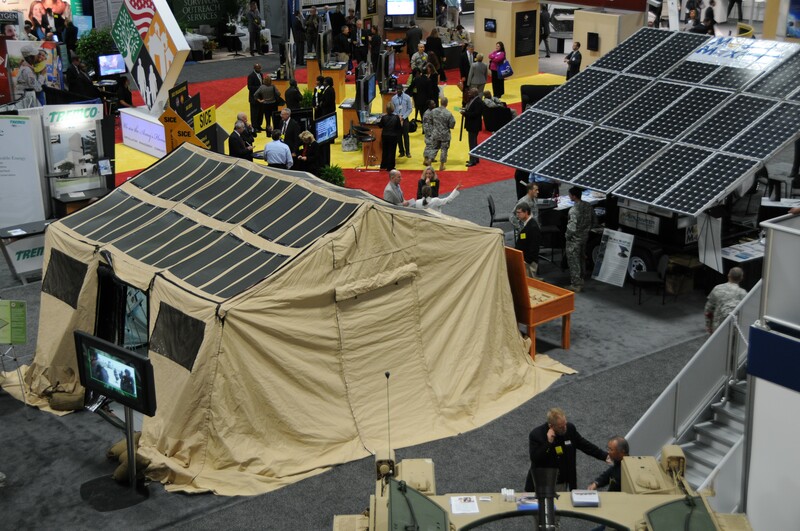 The Army had several examples of energy-saving technologies on display, including a solar-powered water purifier and a tent with solar cells, during the Association of the United States Army's Annual Meeting and Exposition in Washington, D.C.
"The goal is net-zero: net-zero energy, net-zero water and net-zero waste," said Katherine Hammack, the assistant secretary of the Army for installations, energy and the environment. Hammack spoke Oct. 27 during the Association of the United States Army's Annual Meeting and Exposition in Washington, D.C., as part of a presentation on energy security. She specified, however that the Army's goal for 2030 is for energy only, and that the timeline for water and waste goals have not yet been set. "(We're) working on developing strategies. We're testing various scenarios," she said. "Those are our challenges to both our operational forces and to our permanent installations." The effort is part of providing energy security to the Army, meaning that the Army can continue its mission without depending on the civilian power grid. Achieving that would require both a reduction in energy use by finding efficiencies, and also the addition of power-generation capabilities. As part of that effort, Hammack said the Army has a new policy to phase out incandescent light bulbs, which were invented 130 years ago. "It's amazing to me we still purchase them," she said, adding that 88 percent of bulbs purchased today are incandescent. The Army will finish off the incandescent inventory and start purchasing more efficient technology, such as compact fluorescent bulbs. Additionally, she said, the Army has changed the way it designs and develops Army facilities. New construction will incorporate principles from the American Society of Heating, Refrigeration, and Air-Conditioning Engineers standard 189.1. Hammack said new construction will include things like cool roofs, solar water heating, storm-water management and water efficiency. The policies can help the Army find energy savings by as much as 45 percent, she said. "That is going to be our new design standard for buildings," Hammack said. On installations, energy reduction can be found through technology and efficiency, but can also be found through conservation efforts as well, said Lt. Gen. Rick Lynch, the Army's assistant chief of staff for installation management, and commander of Army Installation Management Command. The general said that on installations, efforts as simple as turning lights and computers off at the end of the day can help the Army lower its energy consumption. "We have to create incentives for energy conservation on our installations," Lynch said. In Army's privatized housing, for instance, such incentives are already in place. The privatized housing partners have determined baselines for utilities in Soldier housing. Soldiers in those homes pay nothing for utilities if they use only as much as the baseline. If they go over, they must pay utility bills. But if they go under, they get an incentive. They get paid. Lynch said at the 41 installations where that program is set up, some 80 percent of residents get money back. "We have to find out how to apply that kind of logic to installations and incentivize behavior," he said. Lynch also said energy managers have been appointed at each installation to help garrison commanders meet energy goals. Lt. Gen. Michael A. Vane, director of the Army Capabilities Integration Center, also spoke about applying energy efficiency in the tactical areas of the Army. He said energy savings translate not just to less fuel used, but to more boots on the ground and resources available for the mission. In Afghanistan, where fuel is not readily available from the commercial market, some 60-70 tankers a day are used to power the mission in the region. "Security for supply convoys in theater is estimated to require an average of one combat battalion, on a continuing basis," Vane said. "Ground resupply has accounted for some 30 percent of U.S. casualties in Iraq." He added that winter resupply in Afghanistan can take up to 45 days from the source to the end user, and that fuel and water comprise 70 to 80 percent of ground resupply volume. The per-Soldier demand in Iraq was about 16 gallons of fuel per day and water was at least three gallons a day. About 50 percent of fuel used was for electricity in forward operating bases, which, he said, are typically less than 40-percent efficient, with the overall efficiency of base camp power systems closer to 10 percent. "Just a 10-percent reduction applied to non-brigade combat team Soldiers involved in fuel transport and handling could result in as many as 1,500 or more Soldiers available for other missions and 234 less vehicles per day, or 85,000 fewer road-miles per year," he said. Kristopher Gardner, deputy director for technology in the Office of the Assistant Secretary of the Army for Acquisitions, Logistics and Technology, discussed some of the technologies the Army is looking at to decrease energy consumption and to increase energy efficiency. "We've been doing good with the power-production side: we've got investments in high-density energy-efficient engines for both aviation and hybrid electrics for ground vehicles and batteries," he said. He also said that while on installations, the Army has been good at measuring energy consumption, it has not had the same success at measuring consumption on the tactical side. Strategies for getting at that are included in the "Science and Technology Power and Energy Strategy," the thrust of which, he said, is reducing platform energy consumption. That includes such things as taking equipment off platforms and working on technologies that go into vehicles and on the Soldier. Examples include flexible displays and low-power electronics. Also, he said, the Army is looking at electronics that can operate at higher temperatures, so that there can be weight reduction in the area of cooling. "(They) allow us to operate at higher temperatures, meaning you wouldn't have to cool them as well or as much to get the same efficiencies," he said. The Army is also looking at micro-grid technologies that find reduced energy use through optimized energy distribution, by using technology to connect together 10 previously separate generators, for instance, an installation may find that only half of those generators are needed to run in order to power the mission there. Under Secretary of the Army Joseph W. Westphal said energy efficiency isn't just about "going green." "It's about protecting the lives of our troops and making our military better and more capable," Westphal said. "For the military, that dependence has tremendous strategic and tactical implications. Strategically, too much of our oil comes from potentially volatile places on Earth. There's no way Congress or the American public would allow some of those countries that sell us oil to design or produce the weapons systems we use. By buying oil from these places, we give them some say in whether our ships will sail, or our airplanes will fly."